1840: Queen Victoria marries her first cousin, Prince Albert of Saxe-Coburg and Gotha. The prince is something of a renaissance man, and he is deeply interested in design and jewelry. 1843: King Ernst August is named as one of the godparents of Victoria and Albert's third child, Princess Alice. When he comes to Britain, he takes the chance to further press his claim to the family's jewels. A commission is appointed to look into the matter. 1846: As they near a decision on the Hanoverian jewel claim, one of the commissioners suddenly dies, and the claim is put on the backburner. 1851: King Ernst August I of Hanover dies and is succeeded by his son (and Queen Victoria's first cousin), King George V of Hanover. Back in the UK, Prince Albert triumphs with the opening of the Great Exhibition, a showcase for global innovations in the fields of culture and industry. The East India Company was very involved in the Exhibition, and Albert was apparently deeply impressed by the Indian jewelry on display. 1853: Inspired by the Indian jewelry from the Great Exhibition, Prince Albert has designed a circlet of Mughal arches, a major feature of architecture on the Indian subcontinent in the preceeding centuries. Using Albert's design, Garrard creates the new Oriental (or Indian) Circlet. The circlet's frame is gold, and Garrard sets it with diamonds and opals, which were among Albert's favorite gemstones. Some of the diamonds used in the construction of the tiara are sourced from older pieces of family jewelry -- precisely the gemstones being contested by the Hanoverian royal family in court. 1854: Victoria and Albert purchase a suite of diamond and opal jewels from Garrard to coordinate with the new opal circlet: a necklace, a pair of earrings, and a brooch. 1857: A new commission meets and decides the Hanoverian claim in favor of King George V of Hanover, awarding a great deal of jewelry from the British royal collection to the Hanoverians. Queen Victoria was reportedly distraught over the ruling, although she was reassured that pieces like George IV's Diamond Diadem were not awarded to her Hanoverian cousins. She wore the George IV Diadem at the wedding of her eldest daughter, Princess Victoria, the following January. 1858: In January, the Hanoverians were handed the following jewels: two diamond bows, two pairs of diamond earrings, a pair of pearl drop earrings, a diamond necklace with a cross pendant, a pearl necklace, a large diamond stomacher, a small diamond crown, and a diamond floral ornament. Some of these jewels, especially the stomacher, had been previously dismantled, and the diamonds had been used in the making of other jewels -- including the Oriental Circlet. Garrard worked with Victoria and Albert to remodel and reset jewelry that included stones that had to be returned to Hanover. The Oriental Circlet was remade at a cost of a little more than 400 pounds. Victoria herself supplied some of the replacement diamonds, and Garrard provided the rest. During this remodeling, the design of the piece was permanently altered. The original was a complete circlet, but the new version had a space left open at the back. 1861: Prince Albert dies in December, sending Queen Victoria into a spiral of grief that would color the national mood for half a century. 1901: Queen Victoria dies in January. 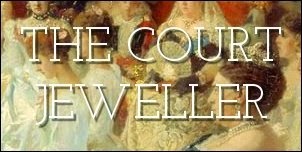 In her will, she designates the Oriental Circlet and the accompanying opal and diamond jewels as heirlooms of the crown, indicating that they should be used by queens regnant and queens consort. 1902: Victoria's daughter-in-law, Queen Alexandra, now possesses the Oriental Circlet and the opal demi-parure. But Alexandra apparently believes that opals are bad luck, and she decides to have the tiara, the necklace, and the earrings reset with rubies instead. The rubies used were also from Queen Victoria's collection. Intriguingly, although Alexandra went to the trouble of resetting the jewels, I'm not aware of any photographs or portraits of her actually wearing the set. 1910: King Edward VII dies, and Alexandra duly delivers the Oriental Circlet and its accompanying jewels (now generally called the "crown rubies") to her daughter-in-law, Queen Mary. 1926: Queen Mary completes the transformation of the crown rubies, ordering that the opals should be removed from the brooch and replaced with rubies to match the rest of the set. Mary is depicted wearing the brooch, but she apparently never wears the rest of the suite or the Oriental Circlet in any photographs or portraits. 1936: King George V dies, and Queen Mary hands the Oriental Circlet and the Crown Rubies to the new queen consort, her daughter-in-law, Elizabeth. The tiara, necklace, earrings, and brooch will become favorites of Queen Elizabeth during her lifetime. 1939: Elizabeth wears the tiara during a royal tour of Canada. 1947: Elizabeth wears the tiara and the crown rubies for the royal film performance of The Bishop's Wife in Leicester Square. 1948: Elizabeth wears the tiara and the rubies on a stamp that commemorates her silver wedding anniversary. 1948: Elizabeth wears the tiara and the rubies for the royal film performance of Scott of the Antarctic. 1949: Elizabeth wears the tiara and the rubies in the royal box at the Odeon cinema at Marble Arch. 1950: Cecil Beaton photographs Elizabeth in the tiara and the rubies for her 50th birthday portrait. 1952: When King George VI dies, the jewels designated as heirlooms of the crown should have passed from Queen Elizabeth to her daughter, now Queen Elizabeth II. But for reasons that have never been made public, the Queen Mother keeps a number of these jewels, including the Oriental Circlet and the crown rubies, in her jewelry box. 1953: Norman Hartnell's sketch for the Queen Mother's gown for her daughter's coronation includes the tiara; however, she doesn't wear the tiara at the ceremony. 1953: A portrait of the Queen Mother wearing the tiara and rubies by Edward I. Halliday goes on display at the Royal Institute Galleries. 1954: The Queen Mother wears the tiara and the rubies at a ball commemorating the Charge of the Light Brigade. 1958: Elizabeth wears the tiara and the rubies for the Union President's Dinner Ball at the University of London. 1960: The tiara and the rubies make an appearance with the Queen Mum at the Nepalese embassy. 1960: Elizabeth wears the tiara and rubies for a theatrical performance. 1961: The tiara and the rubies show up on the Queen Mum at the Royal Albert Hall. 1962: The tiara and the rubies meet another kind of ice when the Queen Mother attends a figure skating championship. 1963: Elizabeth wears the tiara and the rubies to a concert in London. 1964: The Queen Mother selects the tiara and the rubies, plus a ruby floral brooch, for the RADA Diamond Jubilee. 1967: It's the tiara and rubies for a dinner at the University of London. 1975: The tiara and rubies at a party with a young King Carl XVI Gustaf of Sweden and Lord Mountbatten at Claridge's. 1977: Elizabeth wears the tiara and the rubies at an event with Sir Geoffrey Baker. 1979: The Queen Mother wears the tiara and the rubies while making a speech during a tour of Canada. 1980: The Queen Mum wears the tiara and rubies for her 80th birthday celebration at Covent Garden. 1981: Actor Ben Cross meets the Queen Mother, the tiara, and the rubies at the royal film premiere of Chariots of Fire. 1983: Elizabeth wears the tiara and the rubies at the Sadler Wells Theatre. 2002: The Queen Mother dies, and the tiara and the rubies are inherited by her daughter, Queen Elizabeth II. 2005: The Oriental Circlet is worn for the first (and so far only) time by Elizabeth II on a trip to Malta. Rather than wearing it with the crown rubies, she pairs the tiara with Queen Mary's ruby cluster earrings and the Baring Ruby Necklace. 2008: Elizabeth II wears the necklace and earrings from the crown rubies for the first time at a state banquet for the French president, pairing them with the Burmese Ruby Tiara. 2010: The Queen wears the crown ruby earrings on Garter Day. 2010: The Queen wears the ruby earrings and necklace during a state visit to Oman. 2012: The Queen wears the earrings on Garter Day. 2015: At Royal Ascot, the Queen wears the brooch from the crown ruby suite for the first time in public. 2015: The Queen wears the crown ruby necklace, brooch, and earrings with the Girls of Great Britain and Ireland Tiara on a state visit to Germany.